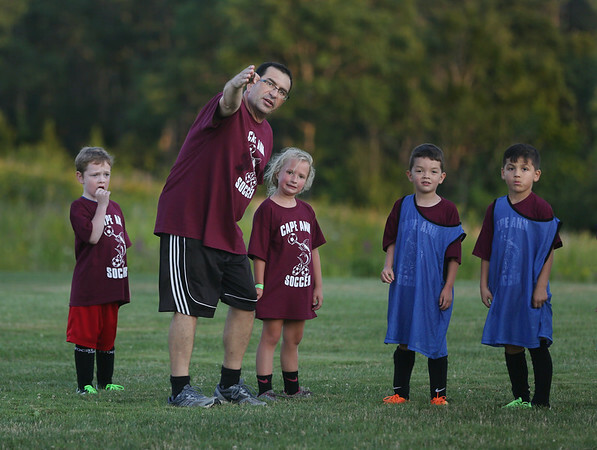 Coach Armando Marnoto leads a group of youngsters in the 7th-annual Cape Ann Soccer Camp Tuesday at Magnolia Woods in Gloucester. Listening, from left, are Angelo Robertson, 7, Willow Manning, 7, Jack Baillie, 7, and Kyle Silva, 6. Eighty campers from four to 13 years of age have participated this summer.